Enjoy your evenings on your private terrace! A rare find in Telluride. Comfortable cozy living area with flat screen TV. Enjoy your days lounging in the sunshine or grilling with dinner on your private patio. Less than a minute walk to lift #7! Plenty of light through dining room windows. Lift #7 (aka Coonskin lift). Just a short walk through the parking lot. New butcher block island and well equipped kitchen. Kitchen with new butcher block counter and all new kitchen ware. Only 132 steps to lift #7. The background shows the ski runs out your door. The mahogany door is Plunge Terrace. Nice amenity - boot and glove dryers. Lift #7 base area - just 132 steps from Plunge Terrace! Seating for 8 guests. Adjoins kitchen and living room. Plunge Condos are located just steps from three restaurants and a liquor store. Beautiful downtown Telluride an easy walk - just four blocks. Such a beautiful place to be! Telluride is so unique in so many ways. 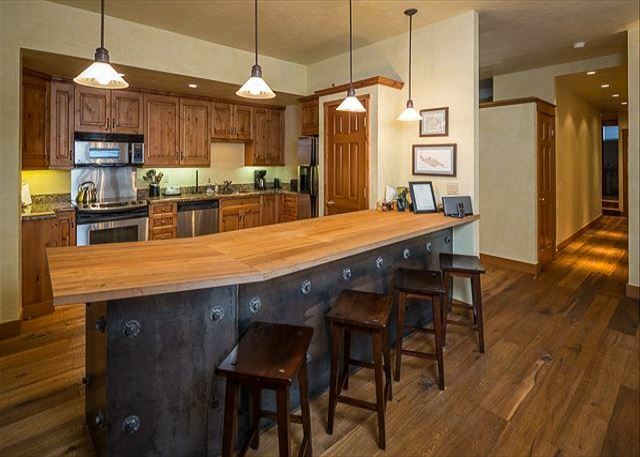 Plunge Terrace is a large 3 bedroom, 3.5 bath condo rental in Telluride that offers two rare features we think you will find attractive. The stone terrace provides guests with a large outdoor living space for entertaining and relaxing: something that is seldom available in a condominium rental. 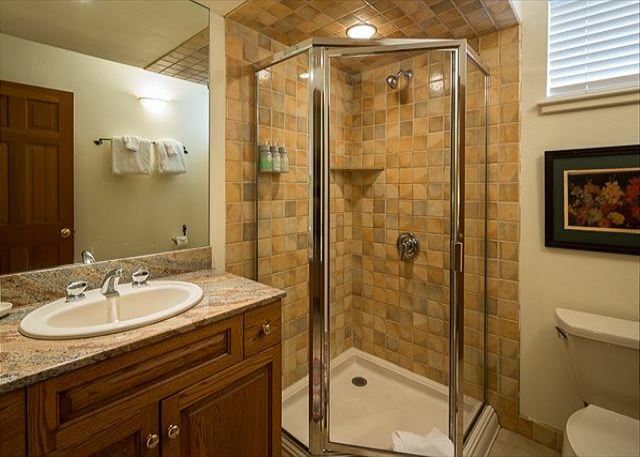 Also, this 1875 square foot condominium - is all on one level and located on the very desirable West Pacific Avenue just 132 steps to Chair Lift 7. 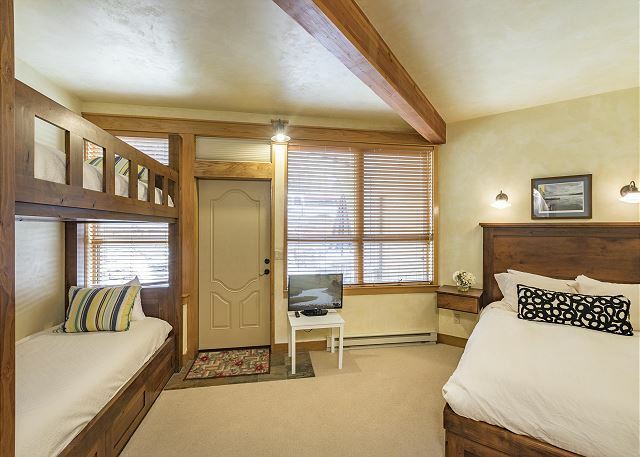 If you are still wondering where to stay in Telluride, reserve this great vacation rental at an affordable price, and wonder no more. New - Plunge Terrace just got a mini-face lift with new carpeting in 3 bedrooms. • Welcome to Telluride exclusively created Spa products ~ Green Tea Lemongrass Shampoo and Conditioner. Satin Body Wash enriched with a blend of botanical extracts and vitamins - this gel will leave your skin feeling clean, moisturized and velvety soft. • Your luxury vacation rental is equipped with the following: salt/pepper, olive oil, basic spices, sugar, Ziploc bags, plastic wrap, aluminum foil, Tide, Shout, Bounce, Dawn dish soap, fresh sponge, trash bags, Cascade and paper toweling. Also, every full bathroom has a hair dryer and Welcome to Telluride exclusively created Spa products. • Daily and midweek cleaning, private chef and catering services are available at the guest's request. • Skiing? All guests receive a 20% discount for ski rentals. Discounted ski lift tickets available online with 7-day advance purchase. No car is necessary at this vacation rental because everything is within walking distance. You are about a seven-minute walk to downtown Historic Telluride or the Gondola, which will take you the Mountain Village Core. 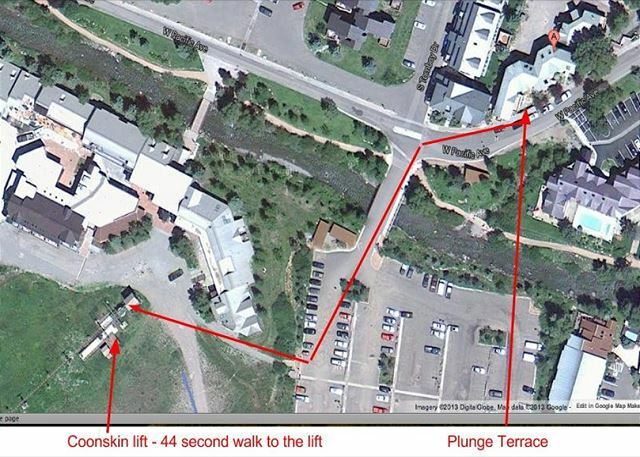 Remember, if it's ski season, Lift 7 is your easiest access to the Ski Area and is just right outside your door. Top of the Gondola is a 6 minute ride away on our free Gondola and another 6 minutes to the Mountain Village core, operating from 7 am to midnight daily. Telluride's free shuttle service, the Galloping Goose, loops through town every 15 - 20 minutes and comes right by your front door. 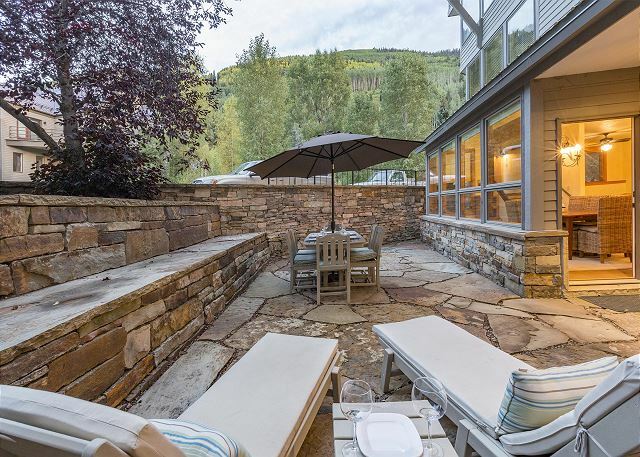 Still wondering where to stay in Telluride? Your vacation will be made as convenient as possible with a complimentary full-time host and concierge. What better way to arrive in Telluride, especially if it is your first visit. We look forward to Welcoming You to Telluride! Great condo. Great location. Very professional and helpful host. Huge condo-- room for everyone plus a personal bathroom for each person. The location is great, right off of chair 7, walking distance to gondola, town and all restaurants/shops. VRY conveniently located next to some of the best restaurants like THERE... (literary on same block). Condo is clean, spacious, and has everything you would need. OWNER was VERY responsive to us which we REALLY appreciated. Best part of the our stay-- Peter, our concierge/manager, was absolutely incredible and welcoming. He made out stay convenient and we felt like we always had his support any time we needed. great place. in excellent shape, well stocked with the basics (dishwasher soap, salt/pepper), good check in and team was very responsive. Wonderful! Perfect location. Roomy condo and well stocked. Would love to stay here again and would recommend to others. Our group of 8 (4 adults, 4 kids) had a wonderful time staying at this property this August! The location was great - close to the creek, trails, gondola, and a short walk from downtown. The condo itself was very comfortable and worked perfectly for us. Would definitely stay here again! 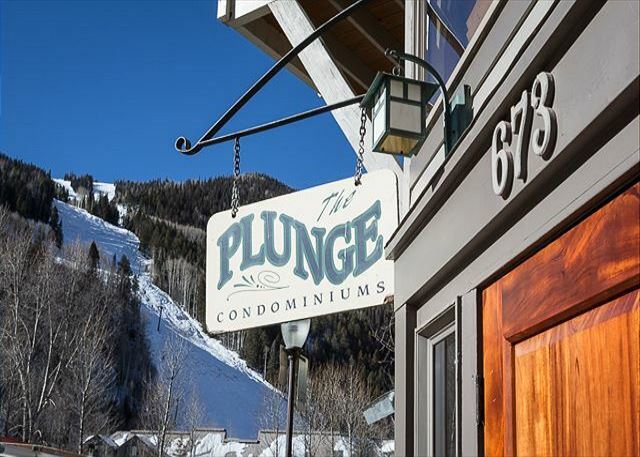 We loved staying at the Plunge Terrace - very spacious for Telluride, great location, lovely hosts. The outdoor patio was a nice spot to hang out and have dinner and play games. Thanks for a great stay! We had 3 couples staying for a long ski weekend and found the condo to be a perfect fit!! Great bedrooms, living area and kitchen. The location is amazing, just across from the Lift 7. 2 parking spaces and a big free parking lot at the west end of the street just 3 blocks away. The concierge was fantastic, giving us great dining tips and making sure our stay was perfect. We look forward to visiting again soon and staying here for sure!! Great stay at The Plunge condo # K. The property was well maintained and the kitchen very well equipped with everything we needed to create wonderful meals. The location was great. Just steps away from the Coonskin lift and the free Galloping Goose shuttle service. We had wonderful customer service from Peter and Pam. We would definitely recommend this property. Great hosts! Lots of opportunities to spend quality time with the family enjoining many different outdoor activities near by. The home was very comfortable with just about everything you could want. Plunge terrace was a wonderful condo for our group of 8. Very spacious and comfortable. It was conveniently located to the lift as well as a short walk to shopping. Peter was great with the check-in process and immediately responsive to questions during our stay. We will definitely return to this condo! Peter and team were very professional and welcoming during the stay. The condo is great for 3 couples plus some kids. Large kitchen, patio and living area makes it convenient for a big group. Great location in town, close to everything. for this Work Vacation we wanted a calm, clean and uplifting place to recharge between meets and films and this condo worked very well. The bedroom do a quite a bit of notice bleed from the stair well above them and that was hard in the mornings. Otherwise the space was perfect for us and gave us all plenty of personal space. Thank you to Pam and Peter! I would certainly work with them again in the future. Just finished an amazing trip to Telluride. The location was perfect, steps away from Coonskin lift and within walking distance to the town, restaurants and shops. Accommodations were great. The rental was spacious, nicely furnished, well stocked and comfortable. I would highly recommend these accommodations for a large group. Management was attentive and provided nice suggestions for dinner, etc. This property was just as described on VRBO and just what we wanted. Plenty of room for everyone, great kitchen and amenities, and nice and close to the ski lift. When a couple of minor repair issues came up, Peter was easily available to take care of them. Thanks for a wonderful stay in Telluride! We enjoyed our first time in Telluride. We have been to Vale, Keystone, Breckenridge, Copper, Park City/Canyons, Alta, Solitude and Brighton a number of times. I would rank Telluride as one of the best from an overall enjoyment standpoint. We love the town, the mountain, ski runs, no lines and the atmosphere. Our condominium was excellent. The only downside was the hot tube did not work and was not fixed until the day we left. We will be back. We really enjoyed our stay at the Plunge Terrace condo. There was plenty of space for the 5 of us. The location was great too. It was on the other side of town from where we typically stay, but it allowed us to discover other restaurants. (Siam Telluride was very good for Thai food). The manager was very responsive during our stay. Peter even provided hiking suggestions for us. The rental was excellent. It delivered exactly what had been stated on VRBO. IT was in an excellent location- close to main street and the free Gondola. The home was incredibly clean and well maintained. The management staff met us when we arrived and were great in showing us around the property. It was a truly great place to spend a few days!!! Peter was very helpful, friendly, and eay to get a hold of. There were a few issues including a broken grill which was fixed the next day. There were a few lights burnt out that were addressed quickly as well. A wonderful place to relax and to call Home for our week in Telluride. Spacious, clean and beautifully appointed. A group of 8 girls met in telluride for a ski vacation. We rented the Plunge Terrace for our stay and it was perfect. The condo was spacious and comfortable, well stocked with linens and kitchenware. Peter, the concierge was more than pleasant and thorough with his advice. Pam was always available to answer questions leading up to our trip. The convenience to the lifts and town was ideal, though lift 7 is an older lift and may not be best for novice skiiers. Grocery store, WINE merchant, and restaurants all within walking distance.. needless to say, we didn't need our care the whole time we were there! We would certainly rent here again should we travel back to telluride.